Congratulations to Steritech Pty, Ltd. based in Queensland, Australia for continuing to move food irradiation forward. On 8 January, 2015, Steritech received approval from the USDA to begin export of tropical fruit to the USA. The list of fruits and vegetables being irradiated in Australia is impressive and expanding rapidly with more than a dozen items approved by Food Standards Australia New Zealand (FSANZ). Australian exports of irradiated produce to New Zealand have grown steadily since 2006. The expansion into the US market is a huge step forward for irradiation. With new approvals and new markets opening worldwide there's plenty to be excited about. Happy New Year! MYTH of the MONTH.. Any commercial irradiator can be used for any food irradiation process. Opportunities in Phytosanitary Irradiation for Fresh Produce Workshop. Why wait for the government? Mechanically tenderized meat labels delayed in US until at least 2018.
ready-to-eat salads, shellfish, fresh produce, cheese or frozen foods? Multi-state foodborne illness outbreaks have occurred in all of those -- and more -- within the past two years, according to records kept by the Centers for Disease Control and Prevention . Food-related illness outbreaks have become a seemingly ever-present facet of U.S. life. But there's a way to intervene, says the retired executive director of the Minnesota Beef Council . Ron Eustice says irradiation could dramatically improve food safety. 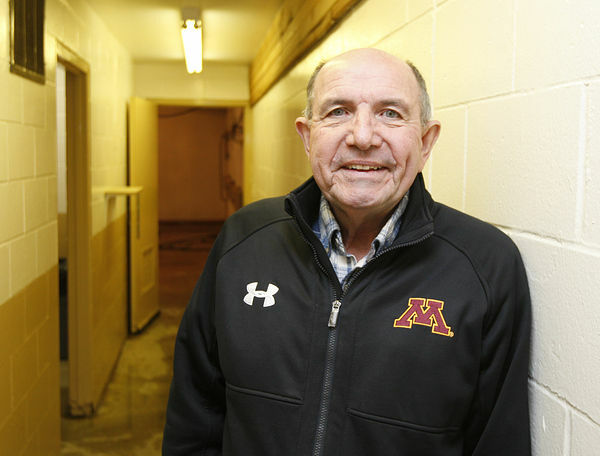 Eustice has long been an advocate for irradiation and remains, even in retirement, the go-to Minnesota expert, even though he now splits his time between Arizona and Minnesota . During a recent visit to a sale of his brother's surrogate-born purebred holstein heifers at the Olmsted County Fairgrounds in Rochester , Eustice spoke with the Post-Bulletin about his belief that irradiation is an underutilized tool in the fight against foodborne illness. In 1997, he said, there were massive recalls of ground beef because of the bacteria Escherichia coli 0157:H7. "If you've got people getting sick and dying, and other people becoming permanently disabled, because of something that can be avoided completely, we should be doing that," Eustice said. Tens of millions of pounds of ground beef were being recalled. "I was on three TV stations one night. The next day, Michael Osterholm (an infectious disease specialist who was then director of the Minnesota Department of Health ) called me and said, 'Ron, I saw you on television,'" Eustice said. Osterholm told Eustice that he ought to be talking about the need for irradiation of beef, instead of giving excuses about food safety. Eustice reviewed the research, agreed, and two years later, "we served, for the first time, irradiated ground beef at the Minnesota State Fair." Most who tried it said they'd buy it if it were available at the grocery store. The CDC says food irradiation uses ionizing radiation to kill bacteria and parasites that would otherwise cause foodborne illness. Much food already is irradiated and consumers eat it daily with no effects on its nutrition or health effects, Eustice said. For example, irradiation of wheat flour has been approved by the FDA since 1963 to control mold. White potatoes, pork, fruits and vegetables, herbs and spices, meat and poultry have all received the FDA's stamp of approval for irradiation to prevent problems such as bacterial pathogens, insects and parasites. The beef industry put many safeguards in place, even before irradiation grew in use. "Your chances of getting E. coli today are probably greater from the lettuce that you put on your hamburger than from the hamburger itself," Eustice said. All ground beef from Schwan's and Omaha Steaks is irradiated, and clearly marked as such. "The beef industry has been able to do a pretty good job of producing safe food," Eustice said. But, he said, "we still have kids getting sick. We still have older adults getting sick." The incidence of E. coli has gone down, but it hasn't gone away. Companies that use irradiation have never since had a recall on ground beef, Eustice said. In the meantime, other companies have dealt with nationwide recalls. "We're talking dozens or hundreds," Eustice said. Precooking and multiple safety techniques, such as production facility sanitation, help. But that's not enough for Eustice. "I'd like to see more companies doing irradiation," he said. "It's like an insurance policy. You know you're not going to get sick from irradiated ground beef." Irradiation, he said, can take care of bacteria in leafy greens, and the internal portions of root crops, extending foods' shelf life. The U.S. imports mangos, guavas, lychees and other produce from Hawaii and Southeast Asia . In order to enter the U.S., that produce must be irradiated, Eustice said. "It's mandatory," he said. This new focus on produce, he said, is the growth area for food production. "This is the most exciting chapter of this whole experience," he said. "Any commercial irradiator can be used for any food irradiation process." Goldilocks was presented with various choices of meals and lodging. Most of these choices provided nourishment and rest. However, only one of each of the options was "just right". 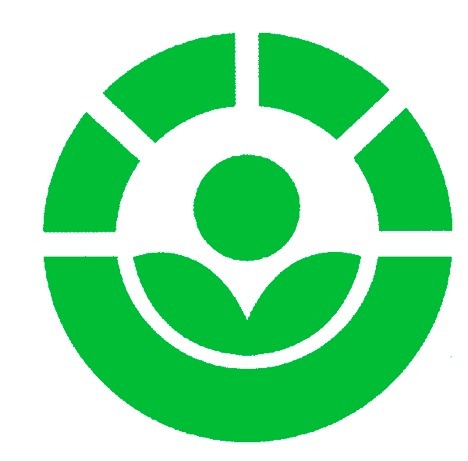 Many food and non-food products are irradiated. The properties of these products vary greatly as does the purpose of irradiating these products. Further, the logistics for handling different products vary from one industry to another and even from one company to another. It is important that the design, location and operation of the irradiator is "just right" to minimize costs, or at least right enough to make the use of a facility economically feasible. Dose: There are many different reasons for irradiating different products. To achieve the desired effect, different doses are required. For example, to stop potatoes from sprouting, a minimum dose of as little as 30 Gray is required. However, NASA requires a minimum dose of 44,000 Gray to irradiate meat for astronauts. Imagine an irradiator with a continuous conveyor system optimized to irradiate the astronaut's meals. To process potatoes in that same irradiator would require the conveyor to travel roughly 1,500 times faster. There might be ways of running the potatoes, but they would not be optimal. Similarly, irradiating the astronaut's turkey would take 1,500 times longer when processed in an irradiator designed for potatoes. Density: The density of different products varies greatly. Generally speaking, as the density of the product increases, the penetration of the radiation through the product becomes more difficult. In essence, the inside of the product is shielded by the outside of the product. The effect of this shielding is a function of density. This property ultimately affects the dose uniformity throughout the product. It can be compensated for by configuring the thickness of the product being irradiated, but that might affect how the product is normally handled and thus not optimal. For many products, dose uniformity is not an issue. However, for some products, such as food, dose uniformity is a major factor. The design of the irradiator is dependent on the dose uniformity requirements of the products serviced. Another role that density plays in the design of an irradiator is related to how the product is conveyed through the irradiator. Higher density products are, by definition, heavier for the same volume of material. A conveyor system designed for high density (heavy) products could be used for both high and low density products. However, the construction of physically stronger conveyor systems requires more and heavier structural components. These conveyor components will absorb a portion of the radiation intended for the product. For this, and similar reasons, a unit designed for heavy products will not treat low density products as efficiently as an irradiator designed specifically for low density products. On the flip side, to run the same volume containers of high density products in a low density irradiator would overload the conveyor system's weight limits. Smaller volumes of the high density product could be run, but this would not be optimal. Flexibility: Dose and density are key factors in the design of an irradiator. There are many more. Ideally an irradiator would be solely designed and optimized for one product at one dose, one density, one package size/configuration, and the specific production volume of that product to run the irradiator 24/7/365. [An irradiator designer's dream!] Unfortunately, for the irradiator designer, the current food products being irradiated do not have the production volumes for a dedicated unit. So, some flexibility needs to be incorporated into the design of irradiators to accommodate similar products and similar processes. The irradiation of perishable foods presents new issues that require greater design flexibility. The current logistics of perishable foods dictate that irradiators need to be able to run both very small and very large lots of products and to be able to efficiently change from one product to another. For some perishable foods such as fruits and vegetables, seasonality becomes a major factor. Generally speaking, the more flexible the design and operation of an irradiator, the higher the costs. A commercial irradiator that can be used for any process will not be as viable as an irradiator dedicated to one specific product. But an irradiator designed for one specific food product would not currently be commercially viable. When Goldilocks looks for an irradiator to process her porridge, she needs to factor in the specific processing and logistics of her porridge and determine what is "just right". Gateway America has become the leader in food irradiation in the Southeastern USA. shouldn't have to wonder if it is safe to eat. Fortunately, in the U.S., food safety is a top priority. One new company in Gulfport is helping maintain the safety of the food we eat. Food Safety Benefits. Gateway America uses a method known as gamma irradiation (or cold pasteurization) to virtually eliminate bacteria, pests, decay bacteria, and pathogens like E. coli, salmonella and listeria from poultry, seafood, red meat, fruits, and vegetables. Irradiation is a clean, safe and environmentally friendly technology that has been approved by the USDA since 1963 and is used in 37 countries. "Basically, it uses small amounts of radiant energy to change the molecular structure of the pathogens and bacteria so they become harmless," says Frank Benso, president of Gateway America. "The temperature change on the product is less than half a degree. So you don't get any kind of off flavors or anything of that nature, and in some instances, it actually enhances flavor." Compared to other methods, irradiation is the safest and most effective way to kill pathogens and pests, Benso says. "This technology really needs to be embraced, and it will be once people understand the benefits," he says. Jennifer Jenkins, manager at Crystal Seas Oysters in Pass Christian, has been working with Gateway America since May 2013. 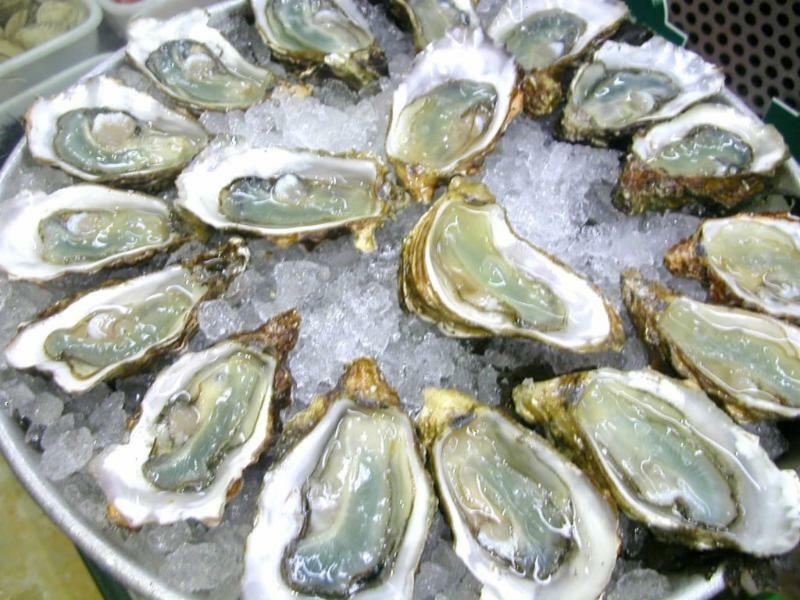 Crystal Seas sells raw, whole oysters to restaurants. 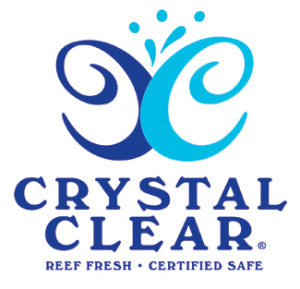 Crystal Seas Oysters, Pass Christian, Mississippi had led the way in making oysters safer. "Using irradiation to treat our raw oysters has allowed us to have a safer, more consistent product," Jenkins says. "Our industry has so many regulations, and it is very important for us to have a safe product. We have had no problems - we have only had compliments on how great the product turns out." So far, Gateway America is the only irradiation facility located in a port city, which is good news for Mississippi's economy. "Mississippi is becoming a logistics hub for other countries to deliver products through Gulfport," Benso says. "The USDA mandates that some imported products are to be treated with this type of technology, and it is opening up trade agreements for specific commodities with countries that previously bypassed the U.S. for these types of commodities. Mississippi is leading the way for this new agricultural trade into the U.S."
Local companies like Crystal Seas benefit from irradiation as well. "It has definitely helped us sell a lot more oysters in the summertime," Jenkins says. "This summer versus last summer, we are probably selling three times the amount of oysters." Benso says after just over a year in business, Gateway America is experiencing tremendous growth. He is optimistic about the future. "All of these good things happening, and Mississippi is in the spotlight," he says. "You're going to see other states looking at Mississippi as a leader in this technology." Two of Australia's most loved summer fruits could soon be on the table in American households. MELBOURNE: Australian mango and lychee growers hope the fruits of their labours will become US favourites, following a new deal on export protocols. Federal Agriculture Minister Barnaby Joyce said it was a difficult agreement to reach, because of US demands that the products be free of fruit fly. "The Americans were very pleased with the work that's been done on irradiation [treatment]," he said. "This hasn't happened overnight." 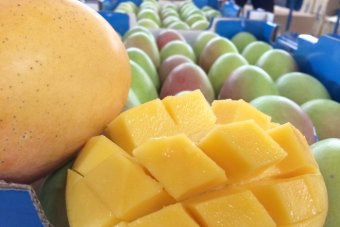 The mango industry hopes cracking the US market will help to double exports, currently valued at $20 million, over the next three years and provide higher returns for growers. Trevor Dunmore, from the Australian Mango Industry Association, said before sending off large volumes, it was important to first understand consumer culture in the US. "This season we're doing a few trial shipments, just to test how they handle the logistics and getting an idea of consumer acceptance. "We believe we've got the infrastructure, the high-quality orchards, high-quality growers and we're developing the logistics to get the fruit in great condition into the US." While Mr Dunmore expected Australian mangoes to attract a premium price in the US, he didn't see prices reaching the $20 per fruit mark seen in some Asian countries. "We're targetting the higher-end niche markets and we think there's great scope for us," he said. To take advantage of the trade agreement, farms will have to undergo a thorough accreditation process to meet traceability, food safety and chemical requirements. Fruit will be treated at approved irradiation facilities to kill any fruit fly prior to export. The Australian Lychee Growers Association chairman, Derek Foley, said his industry first applied to export to the US 16 years ago. "We've actually got one farm, which just happens to be my farm, which is accredited to go to the US," he said. "From that blueprint, next season we will then bolt on other farms to send fruit to the US. We see that as a very big market." In the meantime, Mr Foley said, demand from his other export markets remains strong. He plans to send about 65 per cent of his fruit overseas this season to Singapore, Hong Kong and New Zealand. 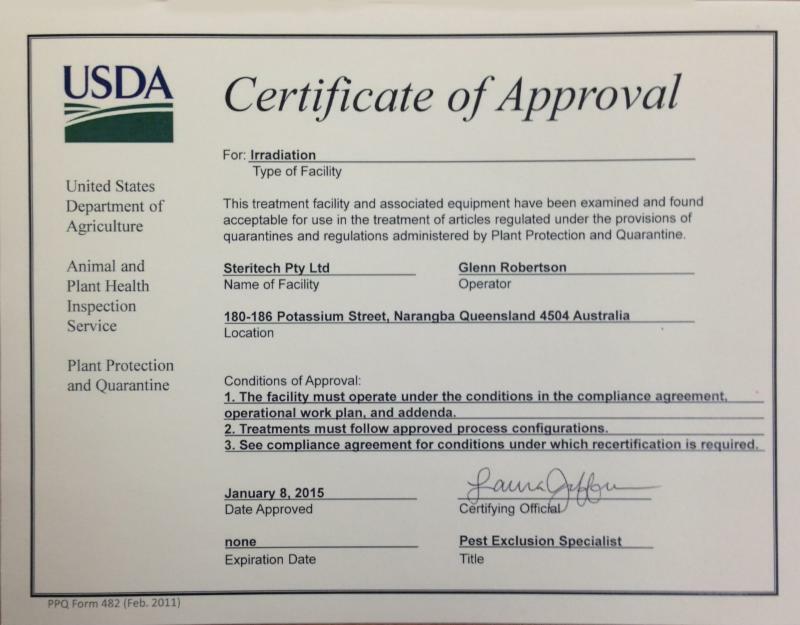 WASHINGTON, DC (January 8, 2015): Steritech Pty Ltd., an irradiation facility based in Queensland, Australia has received approval from the USDA to begin irradiation of produce for entry into the US market. The Australian mango and lychee industry have been working to gain market access into the United States for several years. Murray Lynch of Steritech says, "We are extremely pleased to announce that the Steritech Queensland facility is now USDA Approved, for irradiating Australian mangoes and lychees for export into the U.S.A. We are extremely confident that the first shipment of mangoes to be exported to the USA will occur this season." The bilateral agreement to export Australian mangoes and lychees, will use irradiation as their mandatory phytosanitary treatment for gaining market access. Trade in irradiated Australian mangoes and lychees is scheduled to begin almost immediately. This certification will also make it easier for other Australian fresh produce industries to apply for market access into the U.S.
Food Standards Australia New Zealand (FSANZ) approved an application made by the Queensland Department of Agriculture, Fisheries and Forestry in December to irradiate apple, apricot, cherry, nectarine, peach, plum, honeydew, rockmelon, scallopini, strawberry, table grape and zucchini (courgette) for phytosanitary purposes. On 28 August 2014, FSANZ sought submissions on a draft variation and published an associated report. FSANZ received forty six submissions. FSANZ approved the draft variation on 4 December 2014. The Australia and New Zealand Ministerial Forum on Food Regulation2 (Forum) was notified of FSANZ's decision on 15 December 2014. Australia already irradiates a number of tropical fruits including mango, tomato, capsicum, mango, rockmelon, persimmon, lychee, papaya (paw paw), breadfruit, rambutan, longan, carambola, custard apple, mangosteen and rambutan. The fifth annual "Opportunities in Phytosanitary Irradiation for Fresh Produce Workshop" will take place March 25-26, 2015 at Chapman University in Orange, CA. Over the past five years, Chapman University has partnered with U.S. produce industries and USDA-APHIS-PPQ to conduct quality studies on a variety of fresh fruit. This project is funded by a USDA-FAS-Technical Assistance for Specialty Crops Grant and is designed specifically to assist in developing export markets for U.S. commodities. Please register for this event at http://www.chapman.edu/food-irradiation-workshop. More information about the 2015 Workshop will be posted as it becomes available. The best food providers don't wait for - or hide behind - government. Tenderized steaks and roasts can become contaminated with deadly bacteria during the tenderization process. Needles penetrate the muscle and may imbed the bacteria deeply into the tissue. If not cooked to 160 degrees F. (70 degrees celsius), or irradiated, these cuts can cause serious food borne illness. That's why Costco already labels meat that is mechanically or needle tenderized. Others should do the same. For those waiting for government, a labeling rule which would require packages to provide cooking instructions for the mechanically tenderized meat, had to be finalized by Dec. 31 in order for it to take effect before 2018 under separate requirements of the U.S. Department of Agriculture's Food Safety and Inspection Service. 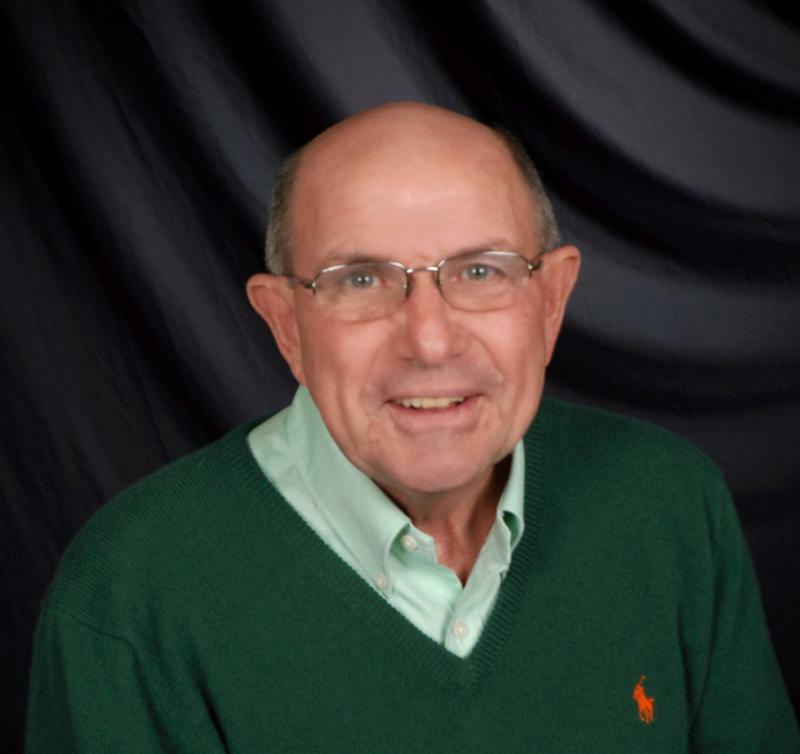 Philip Brasher writes in Agri-Pulse that FSIS first proposed the labeling for mechanically tenderized meat in June 2013 out of concern that consumers aren't cooking the meat properly to eliminate pathogens. 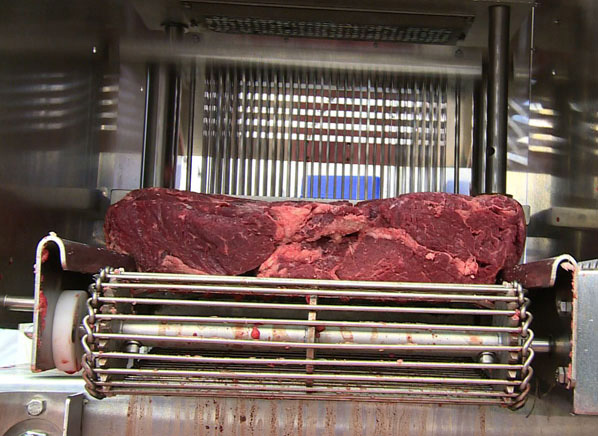 The meat is tenderized with knives and needles that can drive bacteria inside the product. However, the meat industry strongly opposes the labeling requirement and USDA officials did not send the final rule to the White House Office of Management and Budget for review until Nov. 21. The regulation remains pending at OMB. Under FSIS labeling regulations, the labeling rule could have taken effect as soon as 2016 only if it had been cleared by OMB and approved by USDA by Dec. 31. The meat industry has argued that the meat doesn't pose a significant risk and that the special cooking instructions aren't warranted. In comments filed with FSIS in October 2013, the American Meat Institute said that antimicrobial measures instituted by processors assure that the meat is safe.